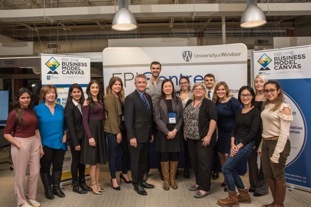 On November 9th and November 10th, the EPICentre hosted its annual EPIC RBC Business Model Canvas Competition (BMCC). The BMCC invited student entrepreneurs to learn about business models, business model validation, and the business model canvas. 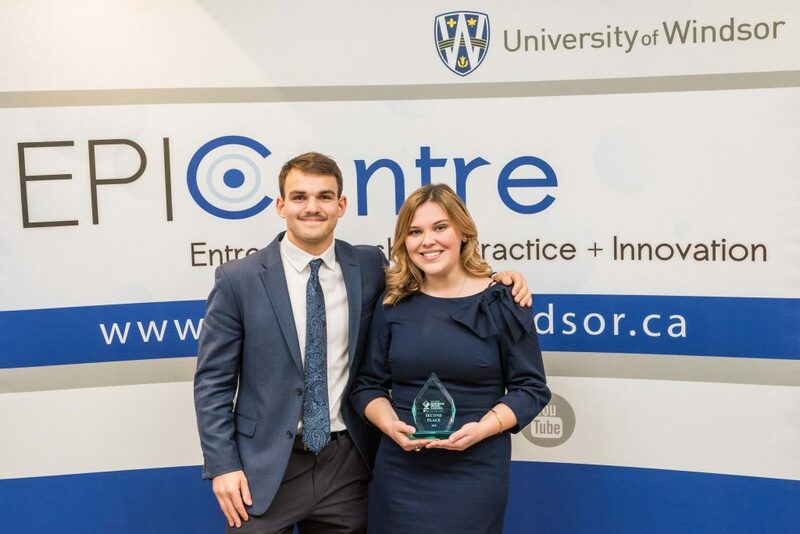 With over 40 video submissions from universities and colleges over Ontario, 15 semi-finalists were chosen to present their business model canvas live at the University of Winsor. Three teams attended from the University of Windsor, 7 teams from the University of Waterloo, 2 teams from Ryerson University, 1 team from Queens University, 1 team from Brock University and 1 team from Western University. Before the semi-final competition began, the teams had a great opportunity to attend a panel discussion moderated by Dr. Francine Schlosser, Professor and Executive Director of EPICentre, discussing how to Identify and Validate a Great Business Idea. The panel consisted of three well-known individuals in the business community: John Savage, Founding Partner of Cypher Systems, Karolyn Hart, Founder and Chief Operating Officer of InspireHUB, and Stephen Cheifetz, Corporate and Commercial Lawyer for Corrent & Macri LLP. Following the panel discussion was the mentoring session for the semi-finalists. 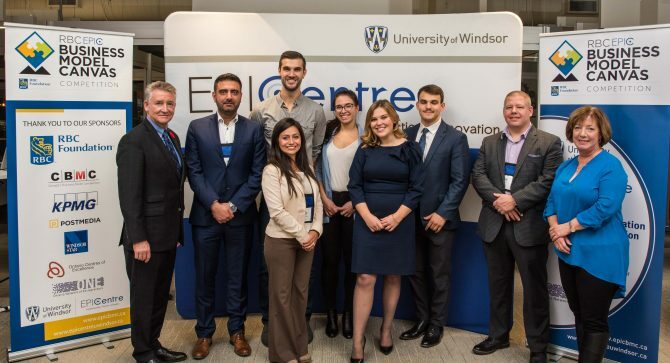 EPICentre had carefully selected 10 business professionals within Windsor-Essex to meet with the semi-finalists one-on-one to review their presentation and provide constructive feedback. Early Saturday morning, the semi-finalists prepared their presentations before the big pitch. Only 6 teams were moving to the final round with room for an additional team as a ‘wildcard’, in case of a tie. There was a total of 4 prize packages to be won. 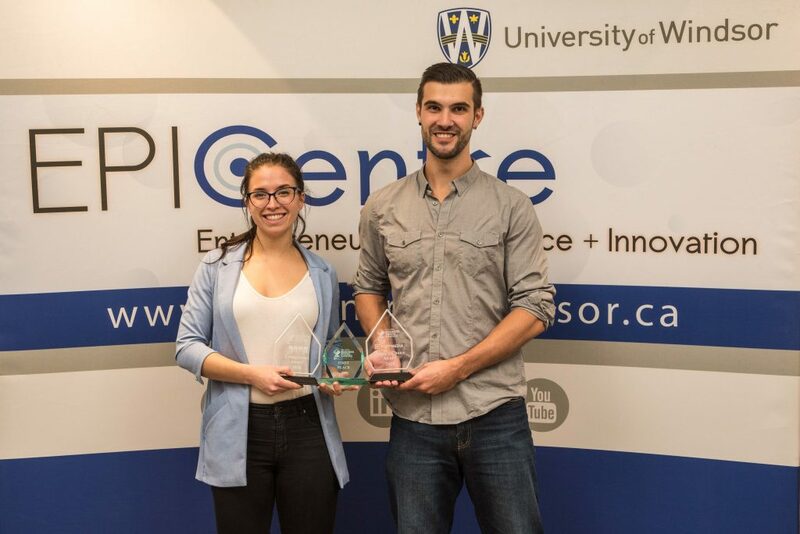 Each of the semi-finalists was eligible to win the People’s Choice Award – $2000 in-kind Postmedia advertising, as well as, the KPMG Financial Competency Award – a $750 cash prize. The top 2 prizes were only available to the finalists. The top prize was $10,000 cash and an automatic qualifier for Canada’s Business Model Competition held in Halifax in 2019. Second prize was a $2500 cash prize and 6-months of free desk space at EPICentre. Nearly 10 business professionals from the community judged the semi-finalists on their presentations. Each team presented in front of a panel of 3 judges. After all the semi-finalists presented, the judges deliberated and the final teams were announced. Since there was a tie between two semi-finalists, 7 teams went on to compete in the final competition. Our finalists consisted of 1 team from the University of Windsor, 1 team from Brock University, 1 team from Queens University, 1 team from Western and 3 teams from the University of Waterloo. The 7 finalists presented in front of a panel of 5 prestigious judges. The winner of the top prize, as well as the People’s Choice Award and KPMG Financial Competency Award, was AidaNote – a speech to text platform aimed at helping students with disabilities. AidaNote was one of the 3 teams competing from the University of Windsor. Second place was awarded to a team from Western University. Their venture, RollUP solutions, collects and upcycles gently-used mobility devices before selling them at a 75% discount to those in financial need. Following the competition, EPICentre received a lot of positive feedback toward the calibre of mentors and judges, as well as, participating teams. EPICentre looks forward to hosting the EPIC RBC BMCC in the future years to come. EPICentre Staff, EPIC Student Ambassadors, and the 2 winning teams. AidaNote – First prize winner along with KPMG and Postmedia Award. RollUP Solutions – Second prize winner.